Small - $56.99 Only 8 left! Large - $56.99 Only 2 left! John Cena wants to teach the world all about his core values: hustle, loyalty, and respect. Your child will need all of these qualities if he wants to become the greatest WWE star that the world has ever known. First of all, he’s going to need hustle to become the champ. Your child will have to wrestle every jabroni in a 5 mile radius if he wants to seize the title of champion, so he’d better have a lot of hustle. Second, your child will need to learn loyalty. Without loyalty, your child will be like The Big Show, who switches from heel to face every other week. Finally, respect. Your child needs to be able to show respect to his elders, especially if he wants his elders to take him trick or treating this year. Maybe the best way for your child to learn these qualities is to walk a few miles in John Cena’s shoes. It’s time for your child to become the WWE star and this officially licensed costume is the perfect way to do it. The WWE John Cena Boy’s Costume faithfully recreates the wrestler’s iconic look. The included shirt is bright blue with “Respect. Earn It” printed on the front. It also has a large image of John Cena on the front. Muscle padding in the chest and arms helps give your child a muscular look that’s ready for the ring. The shorts are camo with blue accents. It also comes with a John Cena mask that fits with an elastic band and a baseball cap with “Never Give Up” printed on the front. 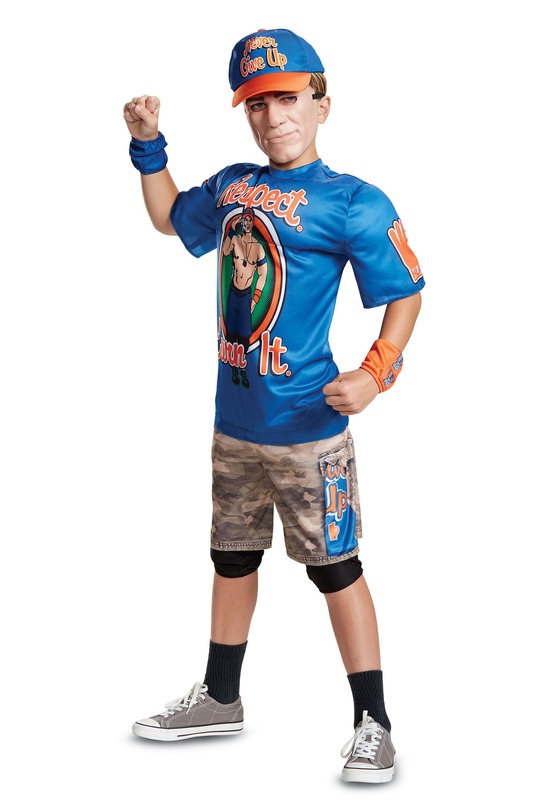 Once your child has this WWE John Cena costume on, he’ll be ready to take on any challenger! Make sure you teach him a few wrestling moves to help get through his matches!